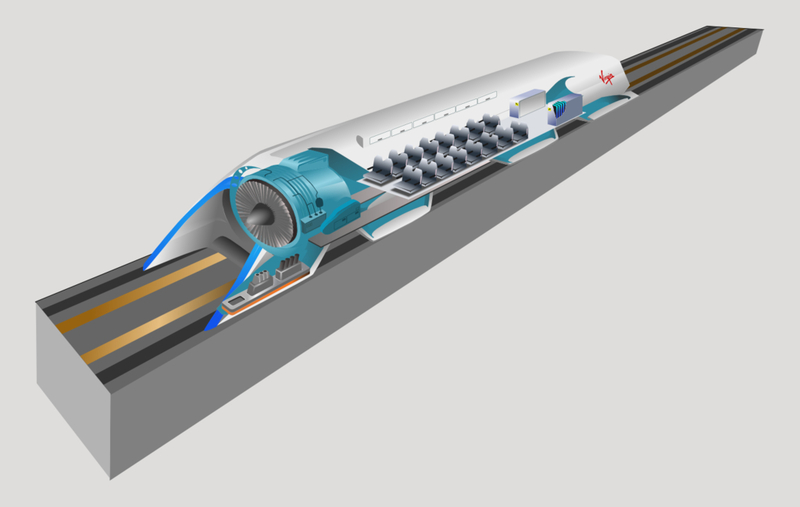 Hyperloop cutaway drawing. Image from SpaceX. Hyperloop, Elon Musk’s pitch for a transportation technology that he says will whisk people from somewhere north of Los Angeles to the East Bay in 35 minutes, was in the news again thanks to a two-day conference held at Texas A&M University. Engineering students from around the world displayed designs for a Hyperloop vehicle. So what is a Hyperloop? And what does any of this mean for advocates for safe, sustainable transportation? How could it be that the home of Silicon Valley and JPL – doing incredible things like indexing all the world’s knowledge and putting rovers on Mars – would build a bullet train that is both one of the most expensive per mile and one of the slowest in the world? Note, I am hedging my statement slightly by saying “one of”. The head of the California high speed rail project called me to complain that it wasn’t the very slowest bullet train nor the very most expensive per mile. The underlying motive for a statewide mass transit system is a good one. It would be great to have an alternative to flying or driving, but obviously only if it is actually better than flying or driving. The train in question would be both slower, more expensive to operate (if unsubsidized) and less safe by two orders of magnitude than flying, so why would anyone use it? A little further in, he writes “The key advantages of a tube [meaning his hyperloop] vs. a railway track are that it can be built above the ground on pylons.” Has he never seen BART? Conventional trains run on the ground when they can because it’s cheaper—there’s no reason a conventional train can’t also run on a pylon. In fact, there are already some HSR pylons in the ground in the Central Valley. He claims that the Hyperloop can be built for less than one-tenth of California’s HSR project. That’s another absurd claim, especially considering he doesn’t even have a prototype. It should be noted that, aside from the branding, Hyperloop isn’t new–it’s a variation on the “vacuum train,” first described by rocket pioneer Robert Goddard in 1910. The idea is to run a pressurized pod inside a huge tube that stretches from city to city. Giant pumps pull the air out of the tube, creating a complete or partial vacuum–and permitting jet airplane like speeds at ground level. But it’s never escaped the realm of pop science because the engineering costs and complications just make it impractical. And while Musk has proposed some solutions, there’s a huge amount of work to be done to see if they have any chance of working. Unfortunately, as a previous post explained, there’s a tendency for publications to simply latch on to anything a creative innovator and businessman of Musk’s stature says, skepticism not required. But they should be skeptical: even the genius Nicola Tesla, the namesake of Musk’s car company, had some crazy ideas that failed. Either way, there’s been enough misinformation about California’s rail modernization efforts–the state doesn’t need Musk sowing more of it. Take a chill, man. First off, this is most likely not a system that we will see deployed in the next 5,10 or even maybe 20 years, or maybe ever. The main purpose of the competition at A&M (where my son’s team came in 3rd) is to spur innovation and practical problem solving for for tomorrow’s transportation challenges by today’s Engineering students. So tell us how to have a viable project which ISN’T “far too expensive”. And no hand waving, Professor. No way someone arriving on a train would drive to Anaheim. WHY would somebody forego almost completely grade separated transit running every half hour to drive in the horrendous LA freeway traffic FROM downtown? If METRO would extend the Green Line to Disney World, I bet it would be PACKED. On an HSR train you really don’t want to look at the scenery. Closeby objects whiz by so fast it can be a big disorienting. That’s not a reason not to build it, but the scenery business is a bit of a red herring at 220 mph. Easy: build HSR from San Diego to Orange County to Los Angeles, and don’t make any engineering shortcuts. Try to complete that project on-time and on-budget for less than $30M/mile. If you can make that work, then consider building other HSR lines from Los Angeles to Las Vegas (project already in planning stage), to Phoenix (a potential extension of the Las Vegas HSR line), and at some point, to San Francisco, if that project were to make financial sense and could be completed at a reasonable per-mile cost. Currently, the LA to SF HSR project is projecting a per-mile cost of $90M, which is more than double the cost of of HSR in Europe. Have you been on a HSR train? You can enjoy vistas perfectly well that are not within a few hundred feet of the rail line. We should understand that the choice of route for the HSR was driven by business interests. Musk, with businesses of his own at both ends was complaining about the practical speed, not the theoretical speed of that HSR plan. Look at the route and try and tell me it wasn’t planned by developers for the intermediate stops it will have, and the profits to be made along the route. Musk wanted to do what the Highway lobby got passed long ago that couldn’t be so easily exploited mid route, use the much straighter I-5 corridor that auto enthusiasts prefer for end to end. At best the HSR will only run a few trains a day non-stop to meet the performance specs. I like to think of the Hyperloop, should it even be possible to build as envisioned, as the real auto trip/ airline trip LA/SF replacement. I remember the days of PSA where I actually did an LA/SF round trip by air in one long day with more than one sight to see there. If it works, a big if, Hyperloop at conveniently timed frequent departures can supplement HSR. Consider the businessperson needing to serve a stop closer to the other end of the HSR. He/she can take Hyperloop to that end adding 1/2 hour by going longer and saving more time by using HSR back and forth to the meeting, still returning within the day to the starting point. in population to Seattle than a megacity like Los Angeles. Seattle is not 50 miles from San Jose – which just happens to be on the way to SF from LA. And Seattle is not across a small body of water from Oakland. I think you have a bizarre concept of “there aren’t a lot of people”. Most of us consider A MILLION PEOPLE to be a lot of people. And yes. People from all over Frenso will drive to the train station to catch the train to LA, rather than driving all the way to LA. And people from all over Bakersfield will drive to the train station to catch the train to SF, rather than driving all the way to SF. SD-OC-LA is actually harder because it’s more urban. The Central Valley route is going to be a lot easier to build because there’s more empty space *between* the cities. It’s not practical, though. This is toying around. Set the engineering students to work on something useful. Maybe modular racking for solar panels? So you would support California HSR if you weren’t believing outrageous lies spread by the road lobby about it. Gotcha. Sure, and if we all had teleporters like on Star Trek, we’d prefer that too. Hyperloop is a revival technology which has already failed on the market for *several very good reasons*. It’s actually idiotic. The construction cost would be at least as high as HSR, operations costs would be much higher, and capacity would be much lower. And to go as fast as Musk advertises, it would have to be MUCH, MUCH more expensive than HSR. The top speed of HSR or Hyperloop is actually set by passenger comfort. To make a very high speed comfortable, you have to have an extremely straight, extremely flat line. That costs vast quantities of money, and the costs for that are *exactly the same* for Hyperloop and HSR. So it’s a train in a very expensive tube. LIMs cost about the same as overhead catenary and ordinary motors. Simple cost estimate for Hyperloop: whatever HSR costs *plus* the cost of the huge tube and air pumps. Hyperloop will cost significantly more than an equivalent HSR. Period. It has no cost savings, and it uses more steel. Absolutely true; in fact, I’d say one should studiously concentrate on those “vistas”. What I found on the TGV is that when the train went into any kind of a cut — and HSR lines do have cuts — I would almost immediately get queasy. Now grant, I’ve always had problems with motion sickness. I camped on the beach at Stinson Beach one summer and when I’d hitchhike over Mt. Tam I’d have to turn down any ride offered that didn’t allow me to sit shotgun so I could look straight ahead. I certainly don’t see anything technically wrong with that, but it would be a political non-starter. The CV and Bay Area legislators would “gang up” and drown the baby HSR train in the bathtub, so to speak. I must say that the Chinese are being taken for a ride on the Las Vegas project. Now that will be a colossal failure. There are two kinds of gamble: poor ones (some of whom used to be rich) and rich ones (who have enough money to lose but not become poor). The poor ones can’t afford HSR fare; they’ll ride buses if they don’t drive. The rich ones will take their G5’s or be driven in the Beemer 7 Class. A few will drive their Ferraris for the thrill of going 140 across the desert. Few will be on the train. As far as I’m concerned, the road lobby can go f*** themselves. They’ve lobbied for too many road construction dollars and not enough biking/walking/road maintenance/urban planning dollars. What I’m talking about it the California HSR’s ridiculous per-mile cost to operate. What do you think about the $90M/mile projected cost? Does that sound reasonable to you when other systems are being build for less than half the per-mile cost? You’re absolutely right that SD-OC-LA is more urban and might be expensive to build. The Central Valley route seems like it would be cheaper and easier to build, however, the SF-LA route doesn’t just go through empty fields and valleys. Rather, it requires boring through three mountain passes, which accounts for a good chunk of the higher projected cost of the SF-LA route as currently envisioned. Not sure you’d enjoy a high speed tube ride either! I wonder how a hyperloop route would be laid out given the projected speeds of 760mph and the human body’s ability to tolerate only so many G’s of force. Looks like each turn would need a radius of about 15 miles to make the turns bearable. Sure, but Union Station is almost as far from LAX as is Anaheim. Almost. You’d be going around two legs of a roughly equilateral roughly right triangle; the Green Line extended would roughly be the hypotenuse. LAX-LAUS-Norwalk is an almost perfect equilateral right triangle (using an air line “route” to LAUS), and the Green Line really IS a hypotenuse. Dude, you do NOT understand railroading. There are actual, real, live human beings living in the intermediate cities and wanting to travel. And there will be a LOT MORE real live human beings living in them in twenty years. The intermediate stops are a feature not a bug. CAHSR costs are higher than other countries because all transportation construction costs are higher in the US, for a variety of reasons. The Hyperloop won’t be exempt from that. Additionally, the mountain crossings are hugely expensive and jack up the cost per mile. If you look at the cost per mile of the Central Valley segment, it’s much closer to the the cost of HSR in Europe. The Vegas HSR route is cheaper because there are no major mountain crossings (hence the Victorville terminus), there are very few people in the path of the line, and the route is engineered for lower speeds than CAHSR. I’m pretty sure I wouldn’t. I like the scenery and deliberately take slower routes to enjoy it. As a matter of fact I like slow trains, although I am not foolish enough to think that they are a viable mode of practical transportation, because of the high labor costs. Has anybody though how LOUD that sucker’s gonna be? Imagine sitting right behind a fan jet and you’ll get some idea. Sure, it’s electrically powered, not a real jet. But moving all that air to propel the bullet at six hundred miles an hour will require a large amount of energy; fans aren’t perfect impellers, so some of that energy is going to become a large roaring sound. Bank on it. That’s a fake number. That’s the “year of expenditure dollars” nonsense, based on assuming high inflation rates and then adding up inflated numbers from years in the future. Do your research. You’ve been bamboozled. Musk put his own money (huge quantities) into SpaceX. Musk put his own money (very large quantities) into Tesla. Musk put his own money (large quantities) into SolarCity. Musk didn’t put one single penny into Hyperloop. Vacuums tend to be pretty quiet and they are using magnets as propulsion. Should be pretty quiet.